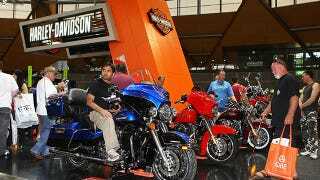 Harley-Davidson is out with a mildly dismal quarterly earnings report, falling the most since the depths of the Great Recession six years ago and lowering its yearly shipment estimates. But the real issue is sales of one of its core money-maker – customs – are falling through the floor. Harley says the reason for the less-than-stellar earnings and changing its delivery projections – from a maximum of 287,000 to 281,000 this year – is because the company won’t chase the steep discounts of its competitors. But there’s more to the trend than just keeping up with the cut-price Jones. The company is seeing an uptick in interest in the same bikes everyone else is – cruisers and smaller street bikes – but sales of the chrome-covered, pannier-bagged, throw-all-your-money-at-the-dealer-to-”make-it-yours” customs are tanking. According to the earnings statement, income made from customs has gone from $29,129,000 to $23,396,000 in the last year, while the Sportster and Street line increased by a little over $2M, and Touring bikes have brought in around $2.5M more. Just as importantly, while overall sales are only slightly down, parts and accessories income has dropped by over $15M. Overall, Harley’s market share slipped from 56 to 51.3 percent in the U.S., which could foretell a larger shift in what people are interested in riding even more than their shift in tastes.